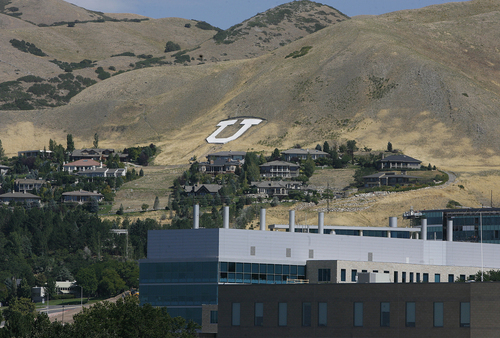 University of Utah celebrates completion of $72M business building. 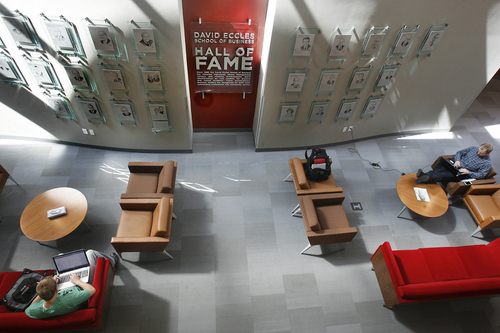 Scott Sommerdorf | The Salt Lake Tribune The Hall of Fame inside the new Spencer Fox Eccles Business Building at the University of Utah, Thursday, September 5, 2013. 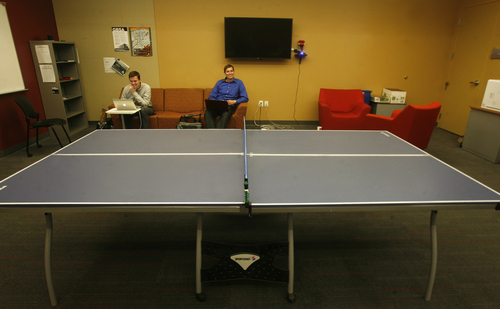 Scott Sommerdorf | The Salt Lake Tribune The Leadership Lounge for graduate students on the 3rd floor comes equipped with a ping pong table. 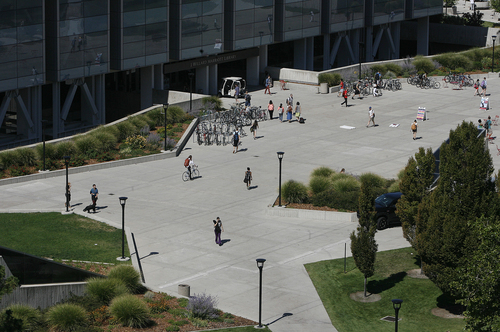 The new Spencer Fox Eccles Business Building at the University of Utah, Thursday, September 5, 2013. 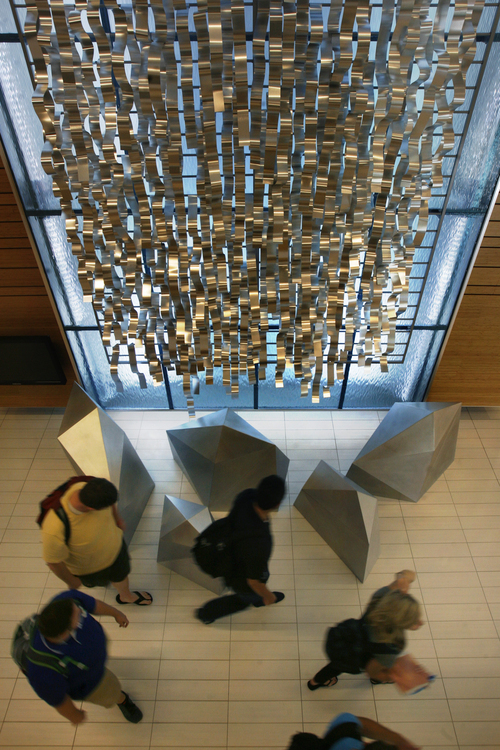 Scott Sommerdorf | The Salt Lake Tribune A waterfall sculpture inside the he new Spencer Fox Eccles Business Building at the University of Utah, Thursday, September 5, 2013. 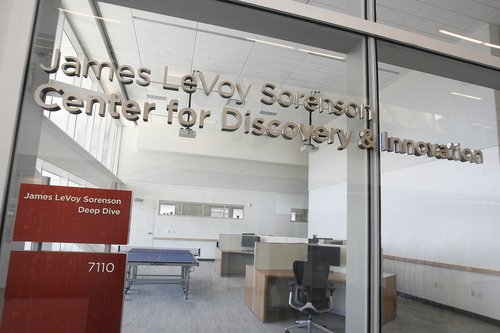 Scott Sommerdorf | The Salt Lake Tribune The James LeVoy Sorenson Center for Discovery and Innovation on the seventh floor of the new Spencer Fox Eccles Business Building at the University of Utah, Thursday, September 5, 2013. All the surfaces of the room including the windows can be used as whiteboards for doodling, and brainstorming. 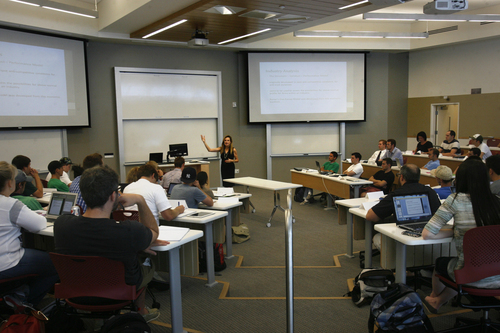 Scott Sommerdorf | The Salt Lake Tribune Assistant Professor Lyda Bigelow teaches a business management class in one of the many new classrooms in the new Spencer Fox Eccles Business Building at the University of Utah, Thursday, September 5, 2013. Scott Sommerdorf | The Salt Lake Tribune Christine Botosan Assoc. Dean / Graduate Affairs, left, and Heidi DeWitt Woodbury Assistant Dean / External Relations, examine the progress of the recreation of the First Security board room inside the new Spencer Fox Eccles Business Building at the University of Utah, Thursday, September 5, 2013. 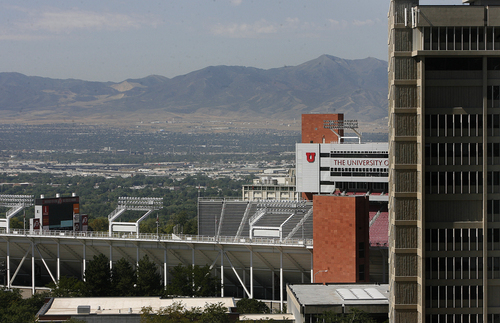 Scott Sommerdorf | The Salt Lake Tribune The view looking east from the new Spencer Fox Eccles Business Building at the University of Utah, Thursday, September 5, 2013. Scott Sommerdorf | The Salt Lake Tribune The view looking west from the new Spencer Fox Eccles Business Building at the University of Utah, Thursday, September 5, 2013. Scott Sommerdorf | The Salt Lake Tribune The Madsen Cafe inside the new Spencer Fox Eccles Business Building at the University of Utah, Thursday, September 5, 2013. 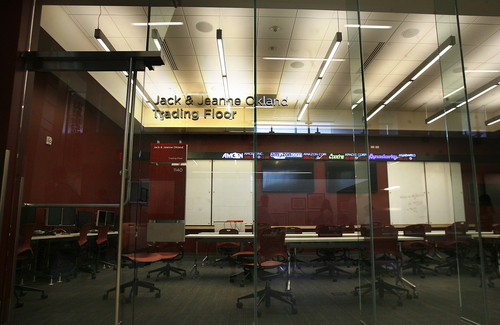 Scott Sommerdorf | The Salt Lake Tribune The Jack and Jeanne Okland Trading Floor inside the new Spencer Fox Eccles Business Building at the University of Utah comes equipped with a stock ticker along the wall, Thursday, September 5, 2013. 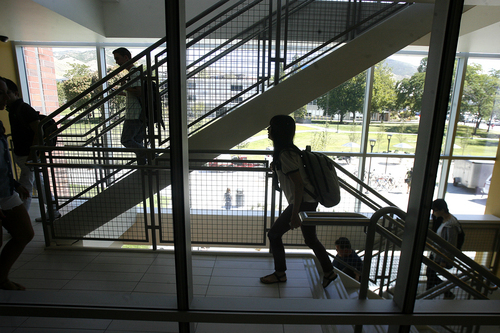 Scott Sommerdorf | The Salt Lake Tribune Students use one of the staircases between classes inside the new Spencer Fox Eccles Business Building at the University of Utah, Thursday, September 5, 2013. Scott Sommerdorf | The Salt Lake Tribune The view looking at the Library Plaza from the new Spencer Fox Eccles Business Building at the University of Utah, Thursday, September 5, 2013. Scott Sommerdorf | The Salt Lake Tribune A portion of the sign announcing the name of the new Spencer Fox Eccles Business Building at the University of Utah, Thursday, September 5, 2013. Scott Sommerdorf | The Salt Lake Tribune The main foyer inside the new Spencer Fox Eccles Business Building at the University of Utah, Thursday, September 5, 2013. After a seven-year-long effort, the $72 million Spencer Fox Eccles Business Building at the University of Utah finally is complete. 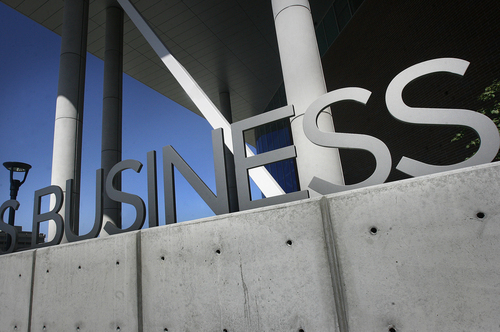 The nine-level, 188,623-square-foot building houses the David Eccles School of Business, which announced the completion of Phase II of the building&apos;s construction earlier this week. Phase 1, which involved about half of the structure&apos;s square footage, was completed in November 2011. "This was a huge project with 10 donors each giving more than seven figures," said Heidi Woodbury, assistant dean of external relations at the business school. In all, about 350 donors contributed $49.1 million to the building&apos;s construction with $17.5 million of that amount coming from the George S. and Delores Doree Eccles Foundation. The state chipped in $22.9 million. The list of donors is a virtual Who&apos;s Who of the state&apos;s business community past and present, with names such as Bill and Pat Child of R.C. Willey fame, James Lee Sorenson of Sorenson Media and L.S. Skaggs of American Stores gracing the classrooms, conference centers and common space. 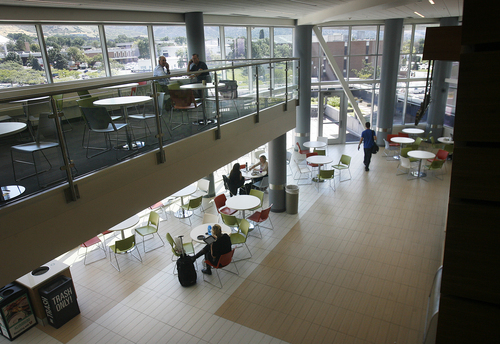 More than 70 percent of the building is for student use  classrooms, computer labs, collaborative meeting spaces and student lounges, said Christine Botosan, associate dean of graduate affairs at the business school. "We&apos;ve been seeing growth in all of our programs and this building will provide a wonderful learning environment for our (more than 3,500) students," she said. 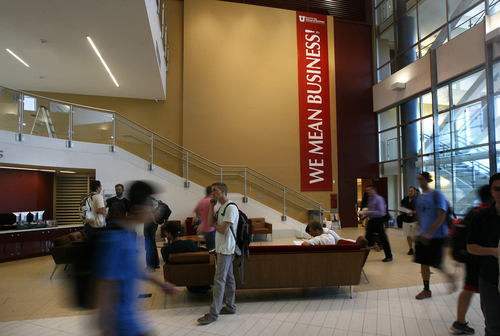 Botosan also noted the building includes the newly created Graduate Career Management Center and Undergraduate Career Management Center, which will connect business students with companies recruiting on campus. She said that function previously was handled by the U.&apos;s career placement center but with the new building there was room to bring all of the business school&apos;s career management activities in-house. "The old building was very outdated and there wasn&apos;t a lot of study space," said Katy Bacca, a sophomore studying business. "This new building offers a lot better learning environment."